When the butterflies first arrive at a sanctuary in November, they are strung out over miles of mountain ridges. Next they begin to gather into clusters. Initially, the multiple clusters are not always connected. But as the temperatures drop in late November and December, the butterflies usually converge into 1 or 2 clusters (though there can be 3, 4, 5 or even more groups). 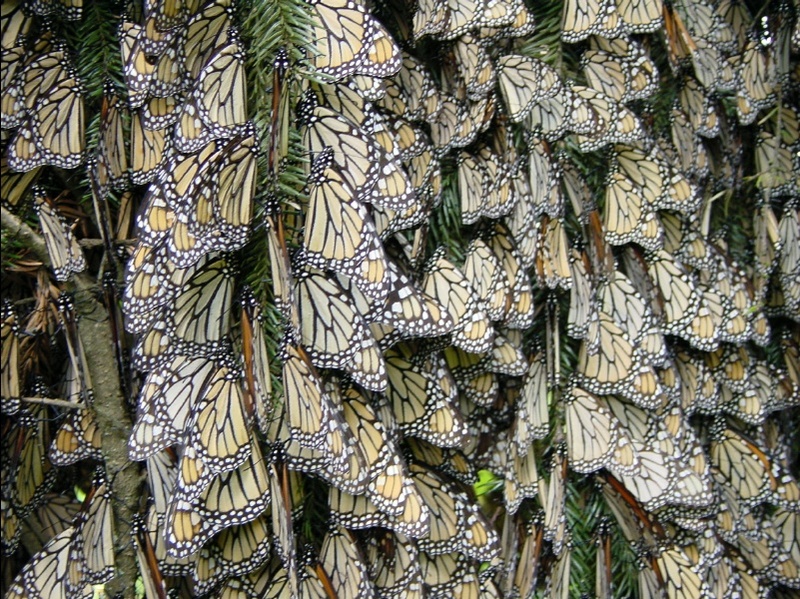 Within each cluster, there is generally an area covered with tightly-packed butterflies. One gets the distinct impression that there are boundaries, even though there might be holes in the area covered, and some butterflies on the edges of the groups. A large cluster might cover 1,000--or even 2,000-- trees. But about 250 trees is more common. 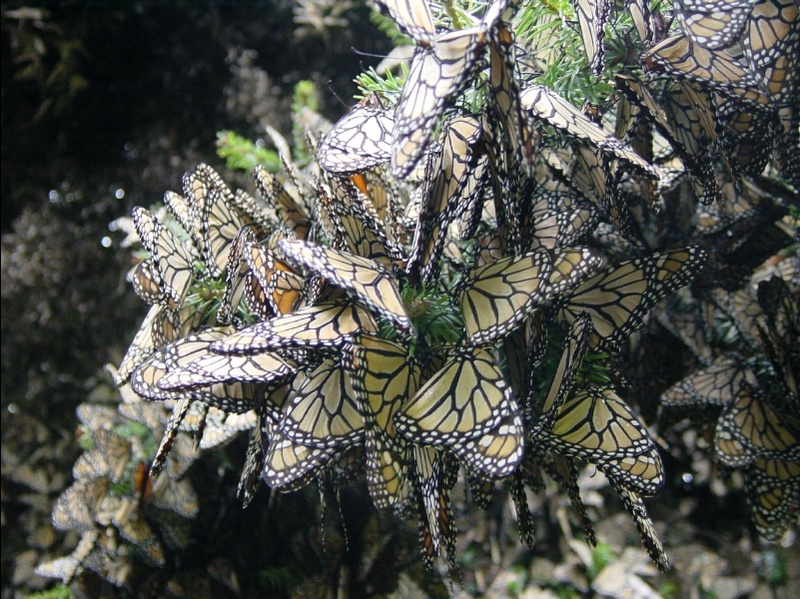 By mid-December the butterflies are packed into very, very dense clusters. At this time there are as many groups as there will be for that year in that particular sanctuary. 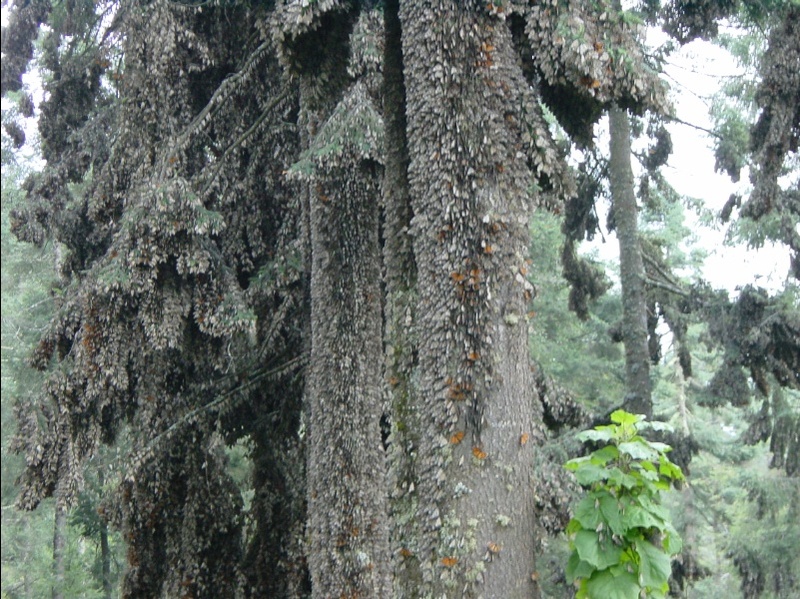 In December/January, when the temperatures are the coldest, the butterflies are packed most tightly on the trees. As many as 15,000 butterflies can be on a single branch--so many that the branch actually bends under their weight! After mid-February these clusters begin to break up, or "bud." The colonies spread out and gain area. They start to split up as the monarchs spread down the canyons for nectar and water. When the butterflies come back up the mountain they don't form thick colonies any more. Try This! How Many Paper Clips Bend a Branch? A monarch butterfly weighs a little less than a paper clip. How many paper clips can you string together to make a tree branch bend? Try it and let us know!